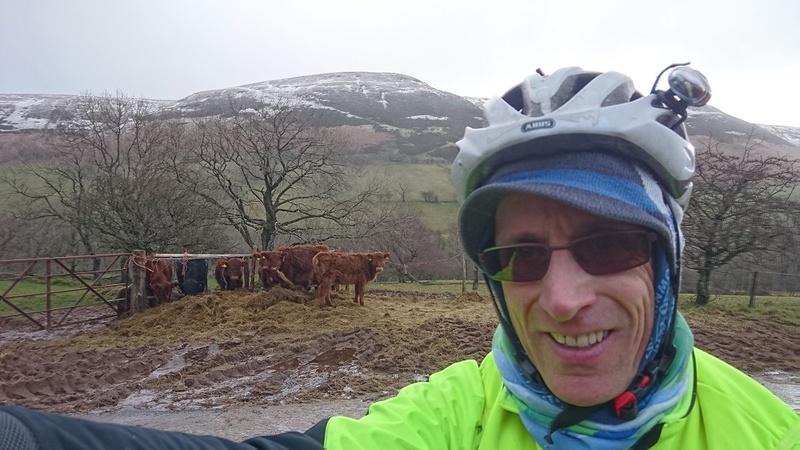 This was my February ride, delayed to March to avoid ice/snow, and the 8th in my series of 12 rides which I hope will conclude with me finally completing the AAARTY sequence in July. The weather was mad on Saturday but Sunday dawned clear and breezy as I left Bristol in he car heading for a start in Abergavenny. My actual "Depart" ended up being a cash machine as usual, this time on the main street of Abergavenny just north of the old Market Hall. The town was silent, partly because it was very early and partly because Wales had won the Grand Slam the night before. 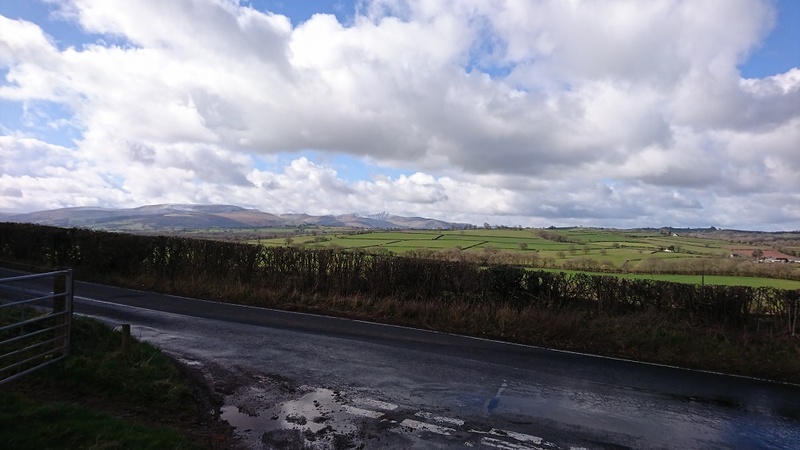 From the main drag of Abergavenny the route went north on quiet streets then rural lanes out past the Sugarloaf and into the Vale of Ewyas - still my all time favourite road despite having ridden it a number of times. I can't see myself ever tiring of these gorgeous mountain views and the total lottery of the weather which can do pretty much anything here at any time of year. The road winds slowly along the valley, sometimes hanging right over the roaring river and sometimes drifting away from it between big fields and thick woods. Above those the colour shifts to the hues of bracken, heather and peat. I wanted to keep moving and not waste time taking photos, each of which takes a couple of minutes as I have to get my phone off the handlebars ( I was using the "occasional google" method of navigation) and back on again, with thick winter gloves on. 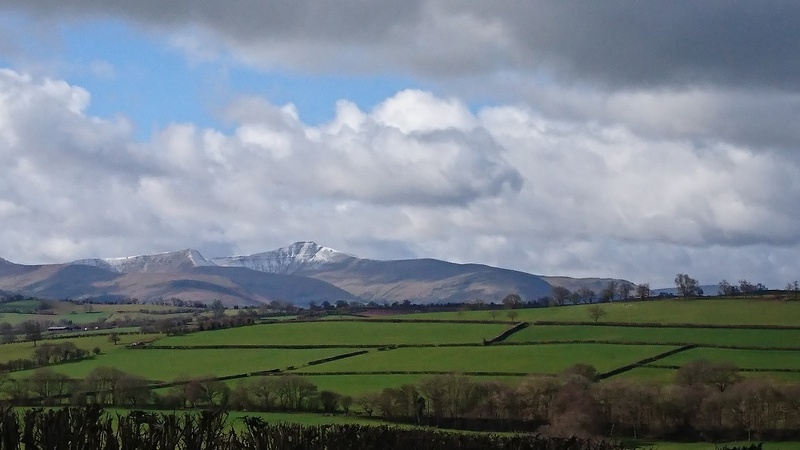 I couldn't resist it though, especially when the snow-covered tops of the mountains came into view. After several quick stops to try and capture the atmosphere with a photo, I came to the hard part of the climb and hauled myself up from Capel-Y-Ffin to the sheep-filled pastures at the top of the pass. Coming over the high point I was battered by winds coming up from the Wye so I had to concentrate hard and forget about trying to get a shot of the epic views over mid Wales. Descending was hard in that wind but I'd prefer that any day over ice/frost/snow all of which were just a little higher. I got slightly snowed on and briefly hailed on, which gave me the sight of a faint but definite rainbow over the Forest Road, then the weather relented and it was back to clear skies and sporadic sunshine. When I got to Hay, none of the cafes was open, so I decided to make do with a mars bar and keep moving. 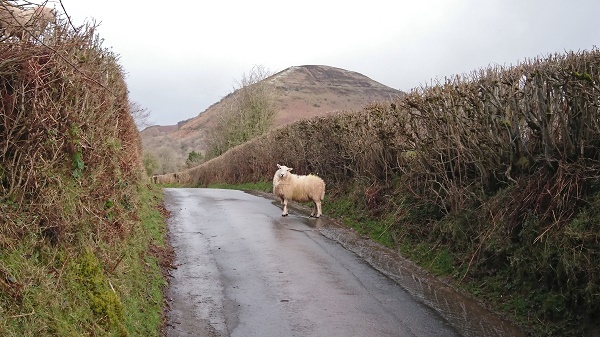 The lanes to Talgarth were very lumpy and I'd exhausted my food supplies by the time I got to Bwlch. It was time to get some serious sustenance before he nasty climb of the day from just outside LLangynidr up to Beaufort, but I stopped at a junction outside a 50's style American diner so the decision to stop there was easy. It was the only open cafe I'd passed all day. 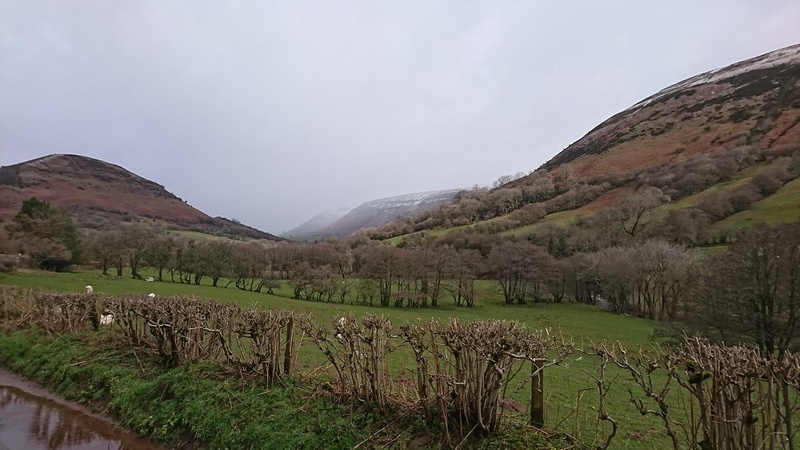 I got a beetroot burger which seemed to do the job, then I headed back out to more views of the snow-covered beacons before crossing the ancient bridge over the Usk and taking the turn towards the heads of the valleys. The climb took forever - slowly crawling up the switchbacks and over the cattle grid - but at last I was up on the tops and rewarded with more ups and downs on busier roads towards Tredegar. This was a culture shock after the silence of the mountains where the noise of the river, birdsong, the wind in the trees and the occasional bleeting of the sheep had been the only sounds. I had used up time at the Little Diner so there was no chance of a coffee stop in Tredegar as well - I grabbed a bar of some. kind in a garage then steeled myself for the climb back to Beaufort and the hilly route to Blaenavon. Soon my google maps app was pointing me towards a cycle route and the longing to get away from cars/noise/civilisation made my mind up for me. Against my better judgement I followed it and susprisingly it was a great move. The route was deserted, smooth and (amazingly) even well signposted. I spilled out onto the road in Garn Yr Erw by the lakes and covered the last part of the stage quickly to wind up at the foot of an imposing hill on the edge of Blaenavon. The garage was an easy option for a receipt then I was back out and into the climb - slow and heavy-limbed now, fatigued but happy. The climb was only a short and manageable one and the reward was a long descent to Abergavenny where I clocked in at 6 hours 30. 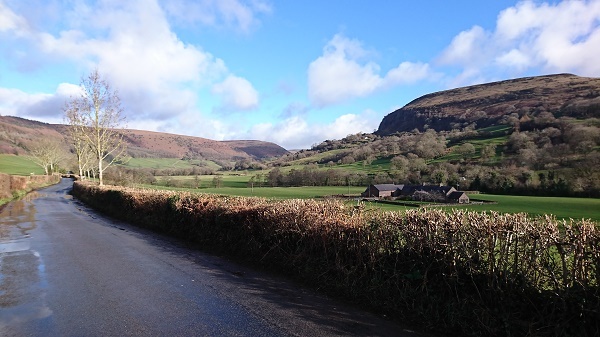 A ride of contrasts - exquisite mountain peace, challenging climbs, friendly folk, a busy spell through the towns at the valley heads then a serene cycleway to make up for it. The final descent was tough going and my hands were hurting on the brake levers by the time I finished but all in all it was a fantastic route. Definitely do this one!